Experience the power of spoken word guided visualizations to relax and transform, as written and presented by Integrative Clinical Psychologist and Hypnotherapist Dr. Juliet Rohde-Brown, and accompanied by specially-designed original music written and performed by Composer Peter M. Morley. Overcome feelings of loneliness, anxiety, and fear of rejection. Find acceptance, trust, and inner peace, through a spoken word guided visualization with Integrative Clinical Psychologist Dr. Juliet Rohde-Brown, accompanied by relaxing music especially designed by Composer Peter M. Morley. Feel Welcome Now contains Earth Birth, a guided visualization to help you feel welcome, accepted, and connected in the world, and Elephant Guide: Relax into Sleep, a visualization especially for those whose worries and ruminating thoughts keep them from falling into a restful sleep. 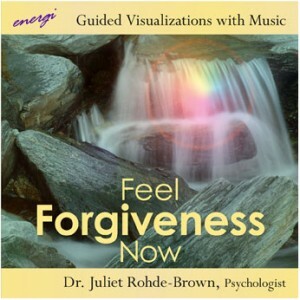 This guided visualization program by Dr. Juliet Rhode-Brown is available as a CD or download. Please visit Energi Music for more information and to purchase. Let go of past anger, reach a place of lovingkindness, and find inner peace through a spoken word guided visualization with Clinical Psychologist Dr. Juliet Rohde-Brown, accompanied by specially-designed original music and nature sounds. Feel Forgiveness Now contains contains two guided visualizations to help you access the physical and mental health benefits of the intentions of forgiveness, compassion, and love. They are designed to guide you into opening your heart and allowing the possibility of forgiveness to enter your life as an opportunity to heal painful experiences and move on and recover from negative acts. This CD has won second place in the Self-Help category for the 2009 Just Plain Folks Music Awards.